It may take over Nathan Phillips Square for three days each summer, but the Toronto Outdoor Arts Exhibition has far humbler origins. Created by Toronto businessman Murray Koffler and his wife, Marvelle after finding a similar show in New York City, the TOAE was run out of the Four Seasons Motor-Hotel's parking lot until its move to City Hall in 1967. Now in its 51st year, the TOAE has now become the largest festival of its kind in Canada, with hundreds of participating artists and an estimated 100,000 visitors over its three-day run. Established artists do display at the TOAE, but the exhibition has always been focused on introducing the masses to emerging local talent they wouldn't normally see outside an art school graduation or gallery group show. It's fabulous exposure for the artists, as well as a reminder to casual visitors of Toronto's booming fine arts community. In addition to the income from sales during the festival, In 2011 the TOAE's award program presented over $30,000 in cash awards and prizes to its participating artists. To further assist emerging artists to find their market, the TOAE has paired up with ARTBOMB, the daily art auction site that focuses on up-and-coming Canadian artists. On July 7 from 2:00-3:30 pm, ARTBOMB's Jim Shedden and curator Andrea Carson Barker will discuss their top picks at the 2012 exhibition. Should you find that perfect piece, exhibitors accept cash and credit. For a step back from the commercial-vibe of the art fair free-for-all, the festival has organised ART NOW, a curated exhibition of artists who responded to a public call for submissions. The program will include video, sculpture, installation, and performance throughout the 3-day exhibition, and will be a welcome diversion from the exhibition's often frantic atmosphere. Allison Rowe's Tar Sands Exploration Station will be a mobile library/laboratory on the Alberta tar sands in a camper van, while Brette Gabel's Booth for Bad Dreams will invite visitors to draw out their nightmares, after which Gabel will embroider the drawing and mail the piece back to the rightful owner. 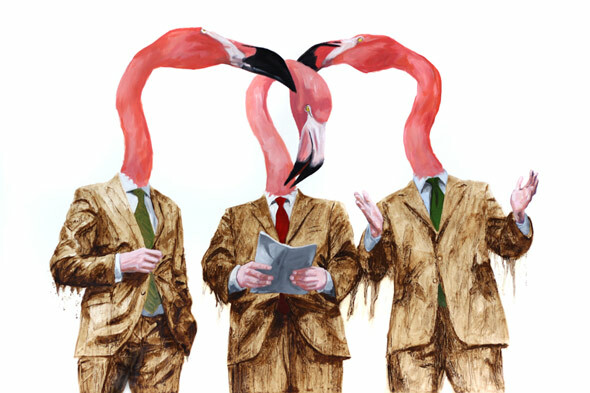 The "animal heads on people" trend has been going for a few years now in commercial illustration, but Tony Taylor's excellent execution and social agenda ensure that his paintings transcend kitsch. Primarily a reflection on world economic forums and the G summit series, the works are a witty critique of inhumane practices and the larger questions of where we're going as a species. I was able to speak to engraver George Walker at this year's TCAF, and his lifelong passion for handmade printing techniques is infectious. His most recent project is a biography in pictures of famed Canadian painter Tom Thompson, who died in Canoe Lake, Ontario at the age of 39. Each page of his "wordless novel" is hand-engraved in a stark, German-Expressionist style perfectly befitting Thompson's curious life and death. Combining impasto painting and collage, Montreal-based artist Jessica Peters similarly combines memory with imagined reality in a whimsical take on buildings from her childhood. 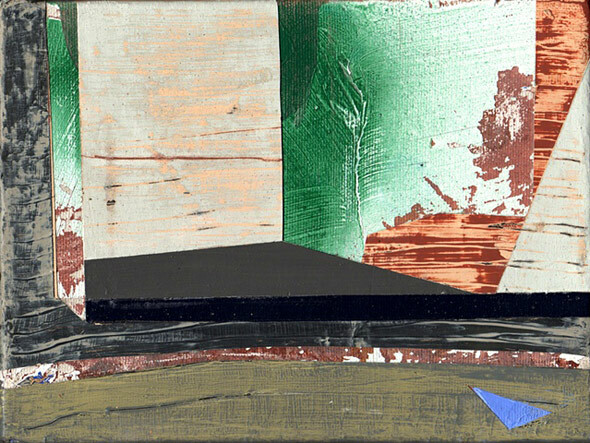 Winner of the Honourable Mention in Painting at last year's TOAE, Peter's abstract architectural spaces have a folk-art bent, and the dynamic mix of colour and texture is visually stunning. Wing Yee Tong, a member of the multimedia artists collective Z'otz*, has a fabulously diverse body of work incorporating sculpture, drawing, installation, and video work. Tong, who has previously won an award at TOAE for drawing, is now listed under sculpture with her intricately cute rugs and a chandelier made of magic gloves and other secondhand clothes. 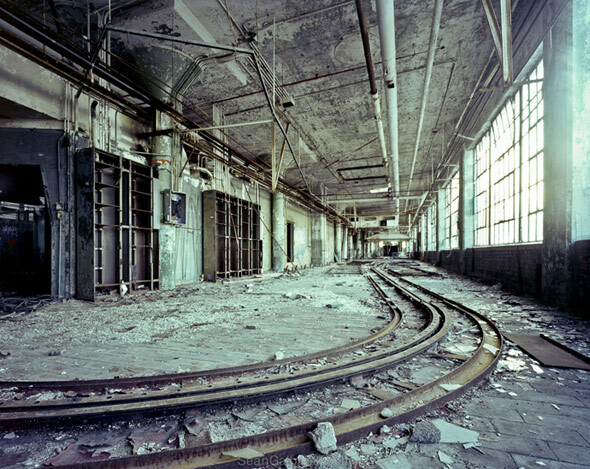 An urban planner by day, Sean Galbraith brings his fascination with deteriorating spaces to his acclaimed photography. Galbraith, who has previously documented the military facilities of Guantanamo Bay, now focuses on Toronto's unseen structures, and his large-format photos detail the abandoned buildings with a clear reverence for what he calls 'modern ruins." The Toronto Outdoor Art Exhibition runs July 6, 7 & 8, 2012 at Nathan Phillips Square. Admission is free.